Raise and rule an entire kingdom in the Kingmaker Adventure Path. From early explorations and cartographic cataloguing of the region, to forays into the deadliest depths of an ancient wilderness, the Kingmaker Poster Map Folio provides the maps for an entire campaign. Within this map folio, you'll find six huge, 4-panel poster maps crucial to the Kingmaker Adventure Path - the mysterious village of Varnhold, the oppressed city of Pitax, and four linked maps that present the infamous Stolen Lands in their entirety. 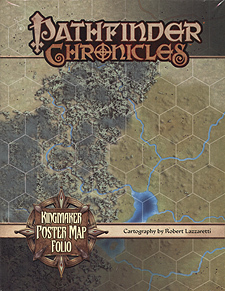 Even if you aren't running the Kingmaker Adventure Path, the maps inside can serve any campaign as new wilderness regions, village, or cities for any RPG campaign. Your new kingdom waits within!